The Society of Jesus was founded in the middle of the 16th Century in Europe. Ignatius Loyola and his nine companions were an international group of theologically and spiritually formed priests. After prayerful reflection they decided to obey one of them as superior and unanimously chose Ignatius. 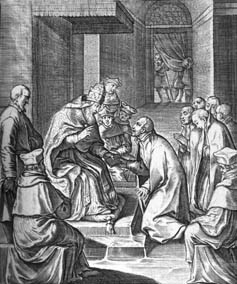 They then offered themselves to Pope Paul III, ready to accept to be sent by him wherever he chose. This was based on the strong belief that the Holy Father, as vicar of Jesus Christ on earth, had the best overview of the Church’s needs throughout the world. All of them lived the deep experience of the “Spiritual Exercises” that Ignatius had written and decided to consecrate their lives to Jesus Christ. For that reason they choose “Society of Jesus” as the name for their new congregation. This desire to serve Jesus Christ through his representative, the Pope, is concretized in the so called “Fourth vow” of the Jesuits. This vow consists in the willingness to accept any mission from the Pope. Although the social and economic conditions in various parts of the world today are quite different from those in the time of Saint Ignatius, Jesuits on all continents are receiving a solid spiritual formation, including a 30-day retreat at the beginning and at the end of their formation, Ignatius’ Spiritual Exercises. All Jesuits make themselves available to follow Jesus Christ in today’s Church and world. 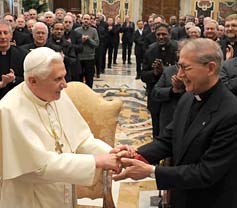 During the 35th General Congregation of the Society of Jesus (January – March 2008), Pope Benedict XVI entrusted the Jesuits with the mission to take the Gospel message to the “frontiers” of faith, culture and civil society. The Holy Father expressed his confidence and the confidence of the whole Church in the Society’s ability to carry out this mission. Official statement: link to a website can you buy viagra over the counter uk 2017 find more information.